All ThanatoSchizO albums are now available on the best digital music platforms: Spotify, iTunes, Google Play, Deezer and Microsoft Groove. A Trompa published a Origami review. Go to the Reviews section to read it. Origami was mentioned by the Versus Magazine staff in the 2011 best Portuguese albums article. Go to Miscellaneous section to read it. Negative Existence published a schizo level review. Go to the Reviews section to read it. Contracultura Aplicada published a Origami review. Go to the Reviews section to read it. El Corte published a Origami review. Go to the Reviews section to read it. ThanatoSchizO was voted on a reader's poll from the Portuguese magazine LOUD! as the 2011 best national band and Origami was voted as the best Portuguese album of the year. Moreover, Guilhermino was elected the second best musician of the last year. Rocking.gr published a Origami review. Go to the Reviews section to read it. Origami was voted by Via Nocturna radio show as the best 2011 Portuguese release. Origami was mentioned on an article about last year's worldwide metal scene published at Sound(/)Zone. Go to Miscellaneous section to read it. 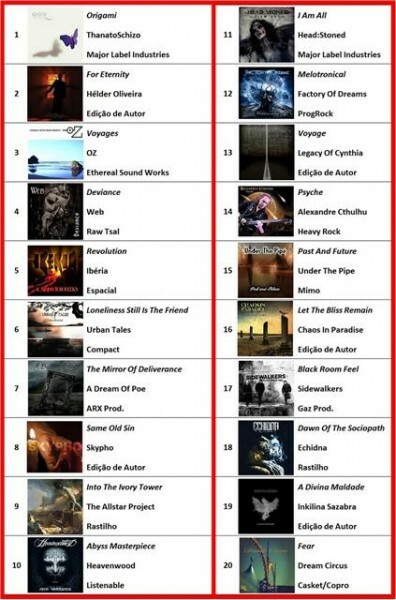 Origami was voted by A Trompa as the 18th best 2011 Portuguese metal release. Here's the list. Origami was mentioned on an article about the best 2011 releases published at Noori Records Go to the Miscellaneous section to read it. Skull Review published an Origami review. Go to the Reviews section to read it. Origami was mentioned by the Metal Storm staff in the 2011 best albums article. Go to Miscellaneous section to read it. Sublime Loss was chosen by one of the writers of Ponto Alternativo as one of the best 2011 songs. Here's the complete list.